Fleetwood Mac News: The stadium-sized psychodrama begins once again, "This war is pretty good!" The stadium-sized psychodrama begins once again, "This war is pretty good!" They are getting rave reviews everywhere they play. 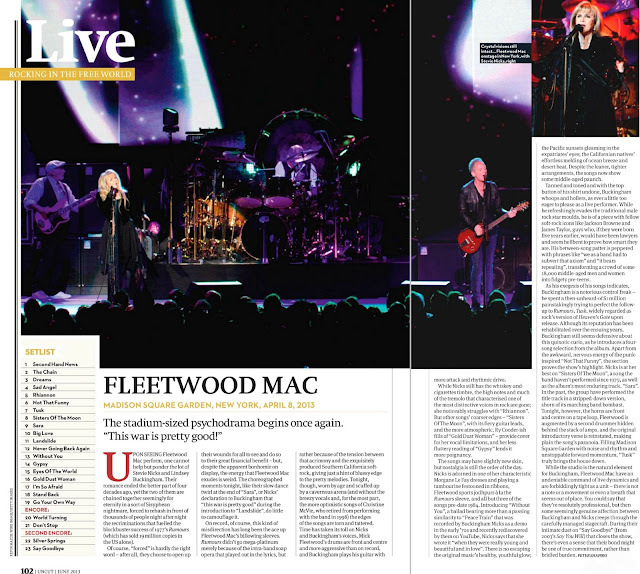 So glad they are giving their fans another round with Fleetwood Mac. Love these guys, they go out and give 110% every night. Happy Birthday Stevie. I think you are amazing, doing what you do and in high heels , hell I had to stop wearing high heels in my early 50's. So you just go with your bad self girl. Stevie has had her matured voice for 15 years now. Why is it still a talking point?